What are some command lines you can run in attempt the bring the VMNIC online? 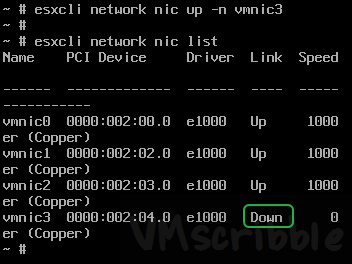 Connect to the console of the ESXi host. 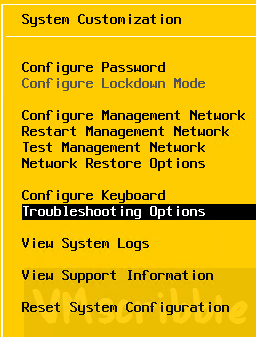 If you do not see a login prompt, hit ALT+F2 and then F2. You might need to hit F2 twice to see the login prompt. 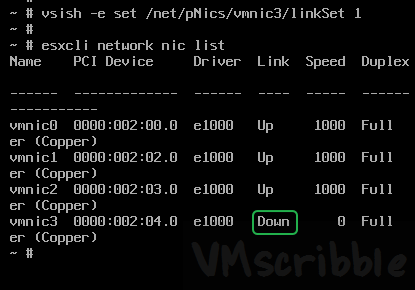 Run the following command replacing the vmnic# with your own. 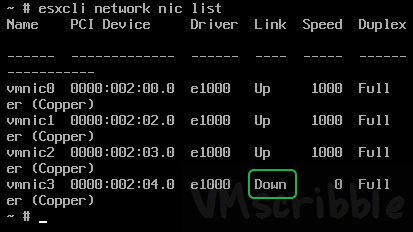 Re-run esxcli network nic list to see if the nic is online. Again, I am using vmnic3. In my case, the driver is the e1000, but on your it maybe the elxnet. This will unload/reload the drivers. The goal is to see of the driver can contact the VMNIC. If the vmnic is still offline, I check the switch port status and even check for a loose cable. If you can reboot, go into the BIOS and see if it can see all 4 NIC…it could be the hardware died.